For information about this event, see the poster below. For additional information, please call Neil at 618.531.2420 or email him at neil.e.das@gmail.com. If you would like to purchase any of these pieces ahead of the show, you are very welcome to do so. Just email Neil. Well done. Very impressed with this effort and trust much will be raised for Pak flood victims. This is amazing. The pieces that people have donated are incredible. I’m so glad you are doing this, and I think it will really make a difference. I’m inspired! Excited about the fundraiser tonight and sending best wishes! I wish I could be there tonight to see all these pieces in person and partake in the conversations. 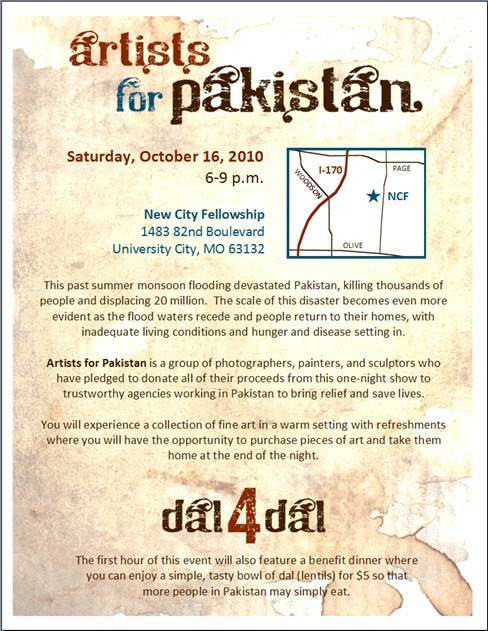 Praying for a meaningful gathering, and good outcomes for people in Pakistan.